The UK has "danced to the EU's tune" during the Brexit negotiations, former UKIP leader Nigel Farage has claimed. 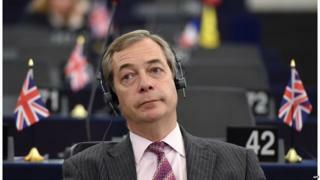 In a debate in Strasbourg, he called the British Prime Minister, Theresa May, "Theresa the appeaser", saying she had "given in on virtually everything". The European Parliament later voted to endorse an agreement struck by the UK and European Commission which is set to move the talks on to their next phase. But MEPs also insisted the UK must honour the commitments it has made. Amid concerns about whether Friday's agreement on citizens' rights, the Northern Ireland border and the so-called "divorce bill" is legally binding, Guy Verhofstadt, the European Parliament's Brexit spokesman, said he had been reassured the UK would not "back-track" on its commitments. The agreement should be converted into a legal text in weeks, not months, he added. In a symbolic but politically significant vote, the European Parliament backed the European Commission's view that sufficient progress had been made on so-called divorce issues to move to talks covering a transition phase and the EU's future relations with the UK. The EU's negotiator Michel Barnier said there was "no going back" on Friday's agreement - which is expected to be rubber-stamped by all other 27 EU members later this week. "It has been noted and recorded and is going to have to be translated into a legally binding withdrawal agreement," he said. During the debate, several MEPs criticised the UK's Brexit Secretary, David Davis, for suggesting in an interview on Sunday that the first-phase agreement was more of a "statement of intent" than a "legally enforceable thing" - comments he has since backed away from. German Christian Democrat MEP Manfred Weber, who leads the centre-right EPP group, said the remarks were "not helpful" for building trust between the two sides. Meanwhile, Mr Farage - who has campaigned for 20 years to take the UK out of the EU - also attacked the British government, saying Mr Barnier "didn't need" to make many concessions to Theresa May. "I'm not surprised you're all very pleased with Theresa the appeaser - who has given in on virtually everything," he said. "She has danced to your tune all the way through this. You must be very, very happy indeed." Warning of a further betrayal of Brexit voters, he said the prospect of a two-year transition after the UK left in March 2019 would be the "biggest deception yet", meaning the UK would have left the EU "in name only". "I think Brexit at some point in the future may need to be refought all over again," he added. But defending the British prime minister, Conservative MEP Syed Kamall said both sides had needed to make compromises and concessions in order to "avoid a no-deal situation". Important progress had been made, he added, when both sides "understood the need for flexibility and focused on building a better future rather than looking back at the past".